If you want to see detail not clear in that image, clicking anywhere on it will load a larger-scale copy (into a new tab). A few comments on layout may be of interest. The actual "house" is the rightmost (eastern) 64 feet of the structure, the part with the dark bar above it on the plan above; the leftmost (west) 40 feet comprise the garage and some utility areas, the part with the thick dark bar below it on the plan above. Because we were building explicitly for ourselves—we expect to live out our lives here—we designed the thing as a one-bedroom house (technically, the TV/guest room is a "second bedroom" for such purposes as bank appraisals). We used space as we saw fit, not as resale value might determine. One enters the house (if not arriving from or through the garage) by a "front door" in the north wall that opens into an uninsulated Walkway; from that walkway, one opens the true "entrance door" (the insulated, weatherstripped one) into the house. That door opens onto an Entry area with coat closet and boot bench, so there are double "airlocks" between the house living area and the outdoors. The utility area to the south of the Walkway shown on the plans as the "Tank Room" is insulated, and has a bank of four solar windows. It is called the Tank Room because it contains a 2,250-gallon water-storage tank, which acts as a thermal "anchor," mediating the temperatures in that room so that in coldest winter they don't go below about 40 Fahrenheit at night, nor above about 65 Fahrenheit in the heat of summer. We use the room as both a greenhouse and a wine-storage area. The house has ten-foot ceilings throughout. But the strip of bathroom and utility rooms in the upper right (northeast)—running along the north wall from the dressing area east almost to the east wall—are built up off the true floor by about two feet and floored with wood planks; that leaves a crawl space underneath so that no plumbing whatever penetrates the true floor (a monolithic concrete slab). For a solar house, insulation and airtightness are crucial concerns, and the high ceilings allowed that build-up trick. 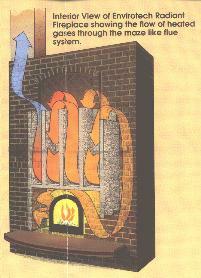 The heated air rising from the airtight firebox is channelled through a maze of passages, allowing it time to surrender most of its heat content to the massive masonry structure of the unit; that heat is, in turn, radiated by the masonry into an air space around the unit, where it warms the decorative facing (in our case, as in the diagram, brick) which then re-radiates that heat into the room evenly and uniformly for many hours, or even days, after the fire is out. This system not only provides very high efficiency heat of the ideal sort—evenly radiant—but, because the fire burns quick and hot (unlike those in so-called "Scandinavian" or "airtight" stoves), there is virtually no pollutant emission or chimney-creosote formation. Now, let's move onto actual interior photos.